Jay and Martha (Evans) Sparks are celebrating their 50th wedding anniversary today. 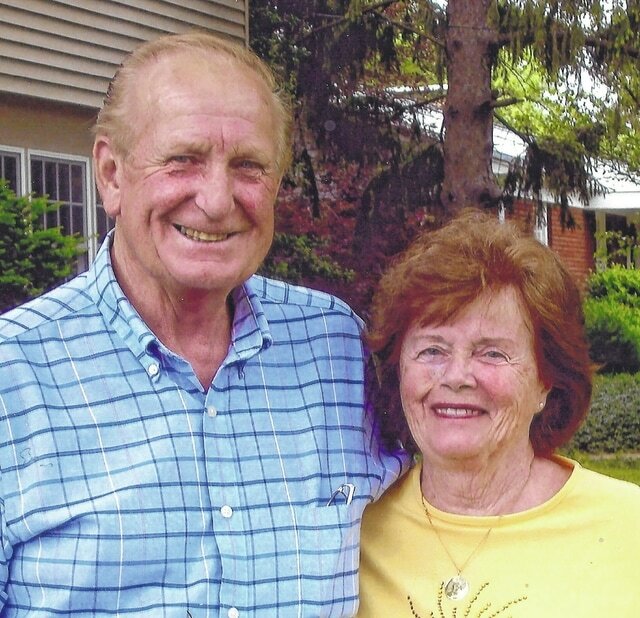 They are high school sweethearts and graduates of Radnor High School in the class of 1961. After graduating high school, Martha headed off to Ohio University and majored in home economics and elementary education. Jay completed his apprenticeship at Marion Masonry. Martha taught first grade at the Radnor Elementary School. While raising their family, she taught Sunday school for the Radnor Congregational Community Church, was a 4-H leader, tutored for Buckeye Valley Schools, was a founding member of the Radnor Historical Society and played an instrumental role in development of the Radnor Historical Museum. Jay was a brick mason for 42 years. His skill earned him the title of Master Mason in near-record time and a reputation for doing top-quality work. He was asked to help reconstruct part of the Ohio Theatre, along with building Crew Stadium and Nationwide Arena. Jay’s local masonry projects included the Sunday school rooms at the Radnor Baptist Church, Buckeye Valley High School, the dugout and concession stand at the Richard Meyer Field, the base for the bell at the Radnor School and the monuments to honor community veterans at the Radnor Cemetery. Throughout their professional careers, growing crops and raising livestock on their family farms have always been an integral part of their lives.